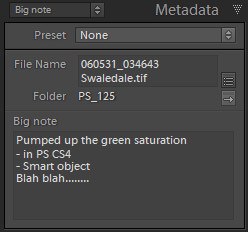 Big Note is a very simple free plugin which adds a custom field to the Metadata panel. The plugin lets you add notes about the picture. You can store any text in the field, and it can also be searched by smart collections. I am cautious about encouraging people to enter custom metadata in Lightroom. It is stored only in the catalogue and is never written to the images’ XMP files or included in files exported from LR. That’s both good, in the sense of privacy, but bad in that the data is trapped inside the catalogue. So I do not generally recommend the use of custom fields if you can’t support them yourself (see the LR SDK and particularly the reference manual). The plug-in is unencrypted so that it can be used as an example for you to add your own custom fields to LR. You don’t have to know much about coding. For example, you might want to add a second custom field to your catalogue, and this would not be difficult to figure out. Big Note is free and should do the very limited job for which it’s designed. But it is totally unsupported.